2X Faster and 3X Thicker than traditional PVA glues! 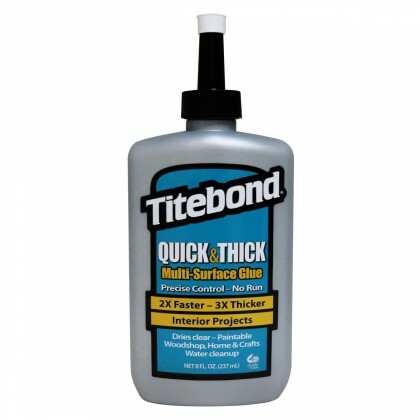 Titebond Quick & Thick Multi-Surface Glue is the thickest, fastest-drying water-based glue available for use with porous and semi-porous materials. It is ideal for wood, pottery, ceramic, stone, glass, fabrics, leather and most craft-type materials. Titebond Quick & Thick develops a bond stronger than wood itself, offers excellent sandability and is unaffected by finishes. It is compatible with all common species of wood, as well as particleboard, MDF, plywood and other porous materials. Methods of application: Plastic bottles for fine applications; glue may also be spread with a roller, spreader, or brush. Titebond Quick & Thick Wood Glue is not intended for exterior use or where moisture is likely. For exterior applications use Titebond III Ultimate Wood Glue or Titebond II Extend. Not for structural of load bearing applications. Do not use when temperature, glue or materials are below 50°F. Freezing may not affect the function of the product but may cause it to thicken. Shake to restore to original form. Read MSDS before use. Keep from freezing. Keep out of reach of children.